Possibly there is not a more demanding crisis than when the microwave oven goes down. All activity in the home stops as fixing the microwave oven becomes priority number one. After all, no coffee can be reheated, no mac & cheese made, no Hot Pockets cooked, and, worst of all, no chocolate melted. Omega Force Services in the Twin Cities offers microwave repair. However, before you call us, try these troubleshooting tips below. Check your breaker. Microwave ovens, especially older models, use a lot of energy. If you discover your microwave oven has quit before it has finished heating, check your breaker. Often, the power in the rest of the kitchen will go out as well as an indication it is the breaker, but this may not necessarily be the case, and it may not come to your mind that it’s the breaker. Locate your utility box, and open it up. One of the switches should be red if it’s tripped. Simply switch this until it’s back to black and then retry your microwave oven. Check the outlet. Some modern outlets switch off if they sense too much power coming into your home. This is for safety so an electrical fire doesn’t start in your home (that would be bad). If you have one of these, the outlet will have a little button you can simply press to reset it. You may want to consider removing other items in this outlet that are plugged in if this problem keeps happening. Inspect the outlet as well, and make sure it looks like it’s working. Check your microwave fuse. Microwave ovens have their own fuses as well that protect the electrical device (in this case, the microwave) from being damaged from an unexpected power surge. Fuses are simply a piece of wire that melts at high temperatures. When the power current soars, the wire melts and the circuit shorts. The fuse on your microwave will need to be replaced. If you choose to DIY this task, make sure the microwave is unplugged before replacing. 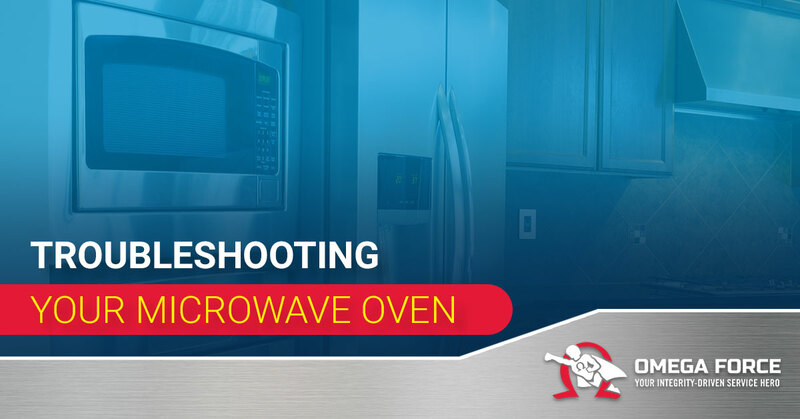 If you have no idea where the microwave fuse is and how to do such a thing, call Omega Force Services in the Twin Cities service area, and we’ll come out and rescue you. Check the door. If the door latch is open and won’t close, your microwave oven won’t work. This is for safety reasons. You will probably need to call in the microwave repair guys (hint: us at Omega Force Services) to get a new door latch. You may be able to find the right one on Amazon, but until drones are in service, it’ll be a couple of days, and the door latch may not work. And we all know we can’t go THAT long without the microwave. It could be the interlocking switches. Have you ever pulled the microwave door open in the middle of heating your leftover dinner because you are too hungry to wait, and the microwave open stops? This is caused by an interlocking switch that again, is for safety purposes. You don’t want to stick your hand and grab food out of the microwave oven while it’s still going. Call your local microwave oven repair company (um, us) to fix this as some microwave ovens have up to three interlocking switches. The cooling fan has failed. Normally, microwave ovens make noises, which is typically the fan cooling and the heat heating. If your microwave oven sounds different than normal, odds are the cooling fan has broken. This is very bad because if the cooling fan doesn’t work, your microwave is in danger of overheating and effectively melting the heating element. This is usually cause for a brand new microwave oven. The heating element is not working. You can also have a short in the heating component of your microwave oven known as the generator. The generator is typically located behind a perforated screen in the microwave oven itself. You can disconnect the generator and replace this fuse yourself as well, or you can call your local microwave repair, such as Omega Force Services if you’re in the Twin Cities service area. Hopefully, one of these will help you solve your microwave oven problem before tears are shed. If not, give Omega Force Services a call. We’ll be over as quickly as possible to avert your crisis situation. We offer washer repair, dryer repair, fridge repair, freezer repair, and oven repair. We can also fix your free-standing freezers and your cooktop. We’re a local appliance repair company that understands how integral household appliances are to your life. When one goes down, it’s hard to compensate. Chores just pile up like the dirty dishes to the point you might go crazy. Before your appliance problem leads you to the insane asylum, Omega Force Services can help. We’re your go-to for all appliance repair needs. We take pride in fixing your appliances. Call us today for appliance repair!